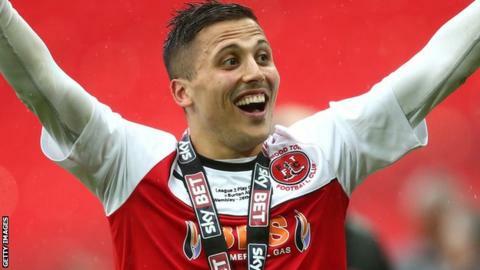 Fleetwood lifted themselves out of League One's bottom four as they put five goals past Swindon Town. Swindon's Adam El-Abd put the ball into his own net for Fleetwood's opener, turning in David Henen's cross. Antoni Sarcevic's penalty doubled Fleetwood's advantage, before he set up Henen to make it 3-0. Tarique Fosu netted the fourth before Nicky Ajose's consolation for Swindon, but Bobby Grant completed the rout with a left-footed strike from 25 yards. Match ends, Fleetwood Town 5, Swindon Town 1. Second Half ends, Fleetwood Town 5, Swindon Town 1. Corner, Fleetwood Town. Conceded by Lawrence Vigouroux. Attempt saved. Tyler Hornby-Forbes (Fleetwood Town) right footed shot from outside the box is saved in the bottom left corner. Attempt saved. Yaser Kasim (Swindon Town) left footed shot from outside the box is saved in the centre of the goal. Attempt missed. Jonathan Obika (Swindon Town) right footed shot from the right side of the six yard box is close, but misses to the left. Corner, Fleetwood Town. Conceded by Jordan Turnbull. Attempt missed. Jonathan Obika (Swindon Town) left footed shot from the left side of the box misses to the left. Goal! Fleetwood Town 5, Swindon Town 1. Bobby Grant (Fleetwood Town) left footed shot from outside the box to the top left corner. Assisted by Conor McLaughlin. Conor McLaughlin (Fleetwood Town) wins a free kick on the right wing. Substitution, Fleetwood Town. Tyler Hornby-Forbes replaces David Henen. Goal! Fleetwood Town 4, Swindon Town 1. Nicky Ajose (Swindon Town) header from very close range to the bottom left corner. Assisted by Bradley Barry with a cross. Substitution, Fleetwood Town. Bobby Grant replaces Tarique Fosu-Henry. Dangerous play by Yaser Kasim (Swindon Town). Attempt missed. Yaser Kasim (Swindon Town) right footed shot from outside the box is close, but misses the top right corner. David Ball (Fleetwood Town) wins a free kick on the right wing. Nicky Ajose (Swindon Town) wins a free kick in the defensive half. Goal! Fleetwood Town 4, Swindon Town 0. Tarique Fosu-Henry (Fleetwood Town) right footed shot from the left side of the box to the bottom left corner. Assisted by Jimmy Ryan.